This is a drawing of a model wearing a day to day fashion icon look and sporting a vibrant and bold orange fro. Hello whoever you are! i hope you're doing well. 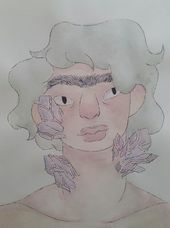 My name is Gavin, I'm a 15 year old transgender artist who wants to share my pieces with you and hopefully many others. All of the pieces you see are either made with marker or watercolor which are my two favorite mediums. I have been creating artwork for about four years now, so since i'm a fairly new and fresh-faced artist i don't have a solid style just yet. I think all of my styles up to my current one are very unique and special,and with each style i grow a little more as an artist.